This baked porridge is sweetened with apples alone, Ella adds raisins to hers, but I couldn’t resist popping in a few baby figs instead. I’m not a huge pecan fan and I don’t really like crunchy bits in my porridge, so instead I added ground almonds for a bit of nutty goodness, giving it a slight frangipane vibe. This porridge is comfortingly spicy, slightly crispy on the top and will keep you going for hours. It would make the perfect easy and healthy brunch or, like me, you can keep it all to yourself and just eat the left overs cold for a few days, saving yourself a bit of stirring over a hot stove! Put the oats into a large bowl with the boiling water and allow to sit for 10 minutes while you peel, core and chop the apples. Add the apples, milk, coconut oil, ground almonds, cinnamon and ginger to the oats, mix well and put the mixture into a pie dish or baking dish. 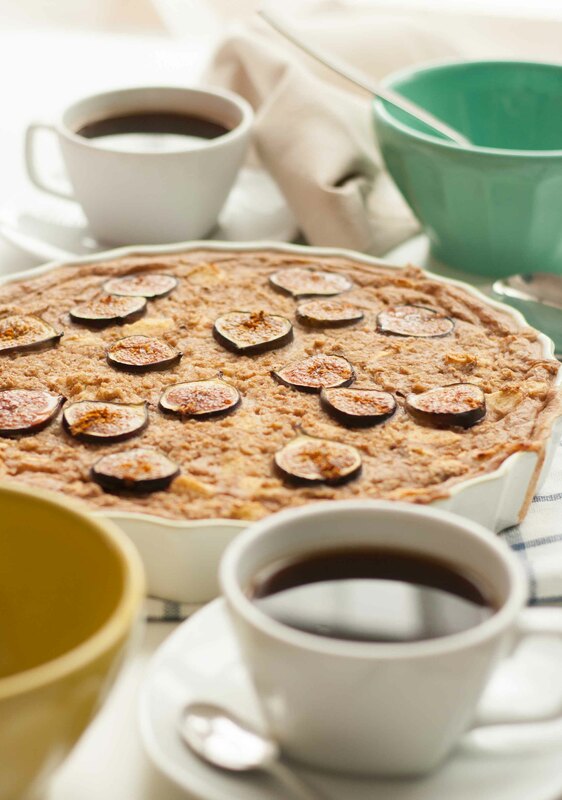 Arrange the figs over the top and pop the dish into the oven for 25 minutes until nicely browned on top. Enjoy! This does sound good and it’s so pretty that it would be like eating dessert for breakfast. Great idea for winter. It did feel a little like that, perfect for a weekend morning!